Food costs are one of your most flexible expenses. These meal planning tips can help you save money, eat healthfully, and enjoy great meals. 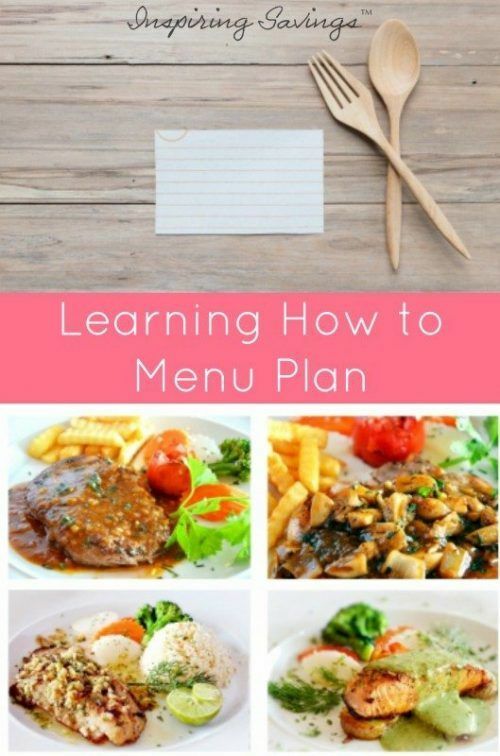 Learn how to menu plan, plus get free menu printable sheets to help. There are numerous ways to plan your Menu Plan. Keep in mind, there really is no right or wrong way to plan If you start out with one menu planning system and after a few weeks you will find that is not going to work then try something else. Learning How To Menu Plan is much easier than you think. All you need is a great start and resources to help you on your way. Remember, Be flexible- If you completed your weekly menu and realize you only made it to Tuesday and want something different. Go for it. If you find that your current menu planning is stressing you out, take a step back and create a system that makes your life easier. Are You Ready to Try Menu Planning? How often do you want to shop for food? Are you using sale item- coupons- weekly flyers sales? Are you planning a menu for 1 week, 2 weeks, 1 month? A functional meal plan should always reflect your schedule. The whole point of a menu plan is to make your life easier, not harder. Therefore, if you know a certain day of the week will be busier than others, then plan for those days. On those busy days plan simple recipes, a slow cooker meal, or have a “leftover night”. Now I know this seems like common sense, but making a list is worth mentioning ( I almost did not even add this to the menu plan list). Make a list of ingredients you will need at the store. Simply writing “beef Cabbage stir fry” on a sheet of paper, might not trigger you to remember the cabbage, or heck, even the beef when shopping. Also, you need to find, make or create a planner. Don’t over-complicate the menu planner process. There is no need with crazy color-coded charts, DIY menu boards, binders, and a million other cute accessories. By all means, if that’s your thing then go for it! A simple sticky note on the refrigerator will do the trick. To be more creative with your menu plan you will need just a little more planning. I have now gotten the hang of menu planning and wanted to spice it up a little (no pun intended). – Do a leftover make overnight – Take the pork chops you made on Monday and turn it into pork fried rice on Wednesday. Had spaghetti and meatballs on Tuesday? Make meatball subs on Friday. –Cook 1 New meal a week– Looking for a new taste? This is one of the best CREATIVE tips and I believe would be beneficial if you feel you are in a cooking rut. I always find inspiration when I search on Pinterest. Dust off an old cookbook and look inside. Plus each week I post new recipes. I love a frugal-friendly recipe. Now that you are organized, I bet you are feeling more comfortable on How to Menu Plan.